THANK YOU DATUK: Nansian (left) handing over a government grant to Kremlin at the presentation ceremony. The first phase of government grants, a total of RM364,000 in all for minor rural project (MRP) funds for 68 villages, NGOs and charities, was disbursed yesterday. BAU: Leaders of various bodies at the grassroots level were cautioned against the misappropriation and abuse of government grants. Assistant Community Services Minister Datuk Peter Nansian said whatever funds received must be spent wisely and gainfully for the benefit of every member of society and not just certain individuals or the leaders themselves. “Leaders of the various bodies have to be very transparent and open with whatever amount they received from the government because the purpose of giving the funds is to help organisations run their activities. Unfortunately, he said, there had been a case in his own constituency where a community leader who received government allocation had used up the money for personal purposes. “It’s not for any individual member or leaders of organisations. Therefore, it is vital for every recipient to prepare and keep the full record for the whole amount of government grants they received,” he said. According to him, every organisation must be able to tell where and how they spent the funds or else they will be accused of misappropriating government grants when their accounts were being audited. “This happens and because of that, it is always advisable for those handling the account of any organisations to keep very detailed statements on how the public money was spent. In my case, I have to record how the funds are being used because at the end of the day, I will also have to submit a report to the government for auditing purposes,” he said. Nansian, who is Tasik Biru assemblyman, said this at the presentation of a total RM364,000 in minor rural project (MRP) funds to 68 villages, non-governmental organisations (NGOs) and charitable bodies at the Dewan Suarah here yesterday. The funds disbursed yesterday were the first phase of the government grants to be distributed through his office this year. “The second phase is coming soon because we want to make sure that everyone will get their share based on their needs,” he added. 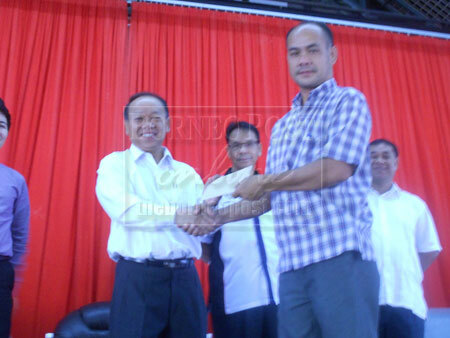 Meanwhile, Kampung Mambong Culture, Recreation and Youth Club chairman Kremlin Sua, who was among the recipients, said he was very grateful to Nansian for the latter had willingly allocated some of his funds to their club although it was not from his constituency. Kampung Mambong comes under the purview of Bengoh, one of the state seats under Mambong parliamentary constituency. “On behalf of our club, I would like to convey our gratitude to him for that and in return we will try to spend the allocation that we received meaningfully as being advised by him at the presentation ceremony,” said Kremlin.